Turn your favorite soup into your favorite stew with this easy recipe. 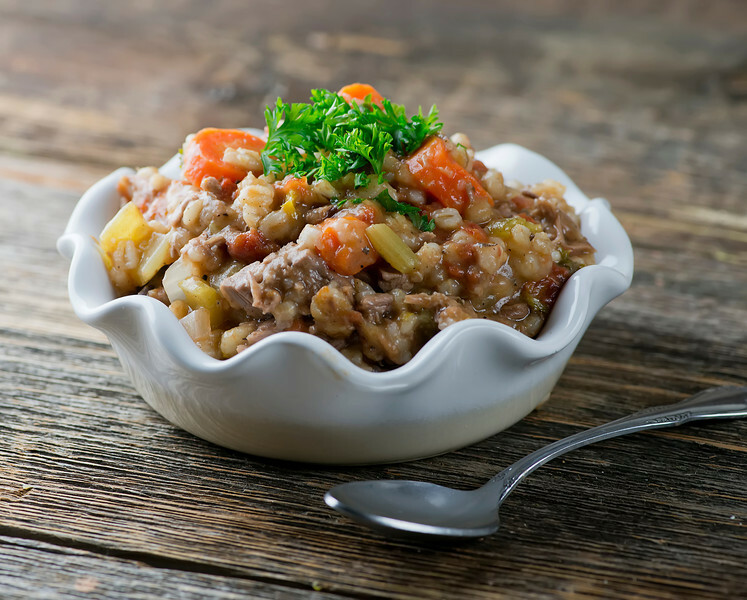 Slow cooker beef barley stew is a warm and wonderful comfort food! Things I love: My slow cooker. Beef stew. Barley. Coming home after a long day’s work to supper that is already made and bubbling away and all ready to be ladled into bowls and eaten up. And so this recipe has vaulted to the very top of my Recipes I Love list, because it combines all of these things together into one scrumptious slow cooker full of deliciousness. AND it makes enough for leftovers! This IS one of those slow-cooker recipes where it does make a difference if you sear the meat first, but it is totally okay to do that the night before, unless you are emotionally capable of searing meat in the morning when you leave for work which I am not. Once you do that, you’re almost home free – just pop that seared beef roast into the slow cooker with some carrots and onions and celery and canned tomatoes, some chicken broth, and a nice amount of pearled barley. The barley is what makes the magic happen…it’s going to thicken everything up into a rich and delicious sauce. Turn your slow cooker on to Low and go about your day. Once your stew has cooked all day, you’re going to take the beef out and shred it. I used a bottom round roast for this stew, and while it took a little elbow grease to shred it, the shreds were perfectly wonderful in the stew – just the right amount of tender meets hearty. You can also use a chuck steak and it will be lovely and perfect. Once the roast is all shredded up, put it back in the slow cooker, give everything a stir, and you are ready for some extremely contented beef barley stew eating. Did I mention that I love my slow cooker? Mix flour with salt and pepper. Place roast in a large bowl, pour on the flour mixture and roll it around to coat it. Heat oil in a large skillet or Dutch oven over high heat. Add meat and sear until brown on all sides. Put roast in the slow cooker and scatter vegetables all around it. Add tomatoes, broth, water, barley and oregano and give everything a nice stir. Remove the roast and shred it, using two forks. As you get to the center it might get harder to shred, but keep at it. The shreds will be just fine in the stew. Return the shredded beef to the slow cooker, stir everything around, ladle into bowls, garnish with parsley and serve. Interesting, I would have guessed beef broth not chicken. I find that beef broth makes it a little too beefy and strong…the chicken broth is a little lighter and lets the taste of the actual meat come through more – it isn’t taken over by the taste of the broth the way it can be with beef broth. But of course, you can use either one! This is one of my favorites…really easy, really delicious. Especially when we’re in a Winter that just won’t quit :). Enjoy!